Photoshop Elements (PSE) knowledge base. - Elements Editor splash screen freezes at launch. - Elements Editor splash screen appears and then goes away. - Nothing happens on clicking 'Editor' tab in welcome screen. - Elements Editor launches fine but hangs just after launch. The issue mentioned can be encountered on both Win and Mac. There can be multiple reasons for this issue. Depending upon the problem, there can be various ways of resolving it. Please follow these solutions in order they are mentioned until your problem is resolved. This is a Windows only solution. If you are facing the same issue on Mac, click here. Note: The steps mentioned below demonstrates PSE11 but the steps are generic in nature and are valid to all PSE versions (just change the version number wherever required). Click on 'Yes' button of above dialog. Hopefully Editor should launch. 2. Remove this plugin and copy it to somewhere else (say on Desktop). Now try to launch Editor (using Run as admin as mentioned in solution #2 of Editor section). Probably it will resolve the crash. If you don't use Twain plugin (required for scanning purposed in PSE), then you are good to go. Right click 'PhotoshopElementsEditor.exe' and select 'Properties' and click on 'Compatibility' tab. 2. 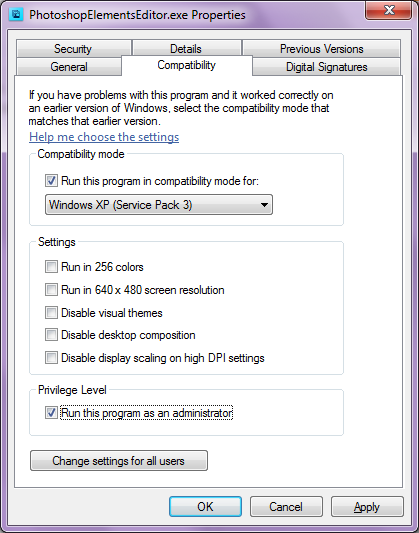 Under 'Compatibility mode pane', click on check box for 'Run this program in compatibility mode for' and select 'Windows XP (Service Pack 3) from drop down. Note: After doing this, if Windows UAC may be prompted (while launching Editor) click on 'Yes' button. In case any network printer is attached try to launch without network or printer uninstall or make different printer as default. Try launching with anti-virus off or removing PSE from conflicting list. Please leave your comments if you have any queries. I will get back to you as soon as possible. Any feedback on improving the quality/content of the blog is highly appreciated. Elements 8 worked fine for me for a couple of years. One day it crashed on opening and hasn't worked since. I have tried all the suggestions above with no success. I have looked at several forums and followed instructions, basically what you listed, with no success. I'm kicking myself for not being able to find the disk for a re-install, but...it's where I am. Could you please specify the operating system you are using? After owning Pse 9 for a couple years now, iam having problems opening the editor. Creating a shortcut to open pse. altering the Twain plugin name( it says pse.8ba) and another which says "save for web(el).8be"
I have a Sony vaio 64 bit laptop running windows 7. After re-installing PSE 9 the editor DID open via the "run the administrator" option for a couple days....and now its being defiant again! Im hoping someone can come up with a genius solution, but if not, can someone please tell me how i can get a refund? Hi, I'm having this problem with PSE12 and have tried all these workarounds but nothing works. I'm running Windows 7 on a Toshiba satellite laptop. I've run earlier versions PSE9 and PSE11 no problems but then bought a new DSLR and previous PSE don't support the RAW, very frustrating that Adobe forces you to purchase a new version, which feels like a backwards move, missing features and poor interface. This problem was killing me -- tried everything. Now when I turned off my the active virus scan part of antivirus program (Bitdefender)and tried to open PEeditor.exe I got "malicious software" warnings popping up !! It listed PEeditor.exe as culprit. I choose "Allow" which added the PEeditor.exe file to 'processes to exclude' box. Now PEeditor opens! ...ahhh.